Technology is the driving force behind the hottest trends in out-of-home advertising these days. Advertisers are eager to use digital billboards and three-dimensional mapping and wallscapes, part of a boom in new media techniques that has sparked renewed interest in out-of-home from the clients of media buyers and planners. Asked to choose the hottest trends in out-of-home advertising, the largest share of readers, 68 percent, picked digital billboards. Fifty-seven percent voted for alternative media campaigns. 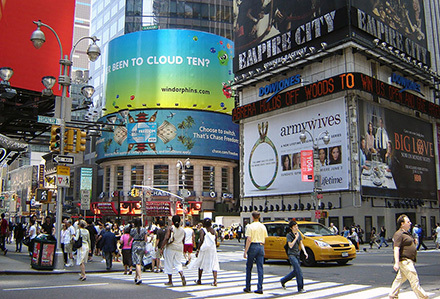 Wallscape advertisements surround pedestrians in Times Square. No other option received more than a quarter of the vote. Survey respondents noted that their clients are most interested in technology-based OOH techniques, whether that means digital or, in the case of alternative media, something with a social media or mobile aspect. “The proliferation of digital advertising has resulted in higher interest in out of home,” noted one reader. “Digital OOH is dynamic and allows clients to change copy quickly and deliver relevant messages faster than broadcast and print,” wrote another. The promise of digital billboards in particular has always been huge. They allow for timely messages to be swapped in and out easily, and the lead time required for advertising is minimal. 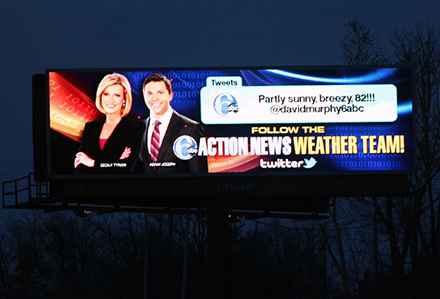 The ABC 6 Action News Weather Team engaged consumers by streaming live tweets about the weather on digital billboards. But their implementation has faced many hurdles, including concerns about drivers’ safety in the face of changing messages and the huge cost of erecting a digital billboard. That’s led to a relatively slow roll-out of these billboards. 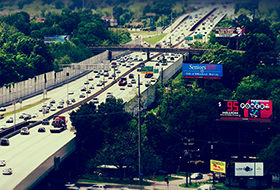 There are currently 4,900 digital billboards across the country, or less than 3 percent of all billboards. Still, with cities starting to lift bans on digital signs and outdoor vendors becoming more eager to invest in them, digital billboards seem poised to finally take off. “The digital boards markets continue to grow, the opportunities continue to increase. And the measurement keeps being improved,” noted one reader. Alternative media campaigns are also hot. Though solid numbers are hard to come by, the Outdoor Advertising Association of America has noted an increase in revenue from alternative media in recent years, and buyers echo that anecdotally. They say clients become more interested in these types of campaigns after seeing or experiencing one themselves. And they’re enticed by the ability to use mobile and other digital technology with them. “Alternative, if done right, seems to be the best way to help your message stand out above the rest,” one reader wrote. Finally, wallscapes and projection combine the best aspects of digital with the attention-grabbing of appeal of alt media. Opportunities for these campaigns are limited by location and also money, as the technology can be expensive to deploy. But advertisers find it intriguing, partly because it’s relatively new. The original article appeared on MediaLifeMagazine.com.